Gaynor realizes that every child is unique and each child learns in a different way. 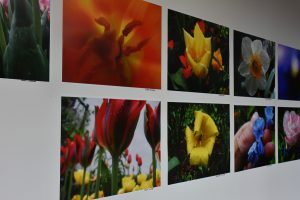 For this reason, we develop an individualized educational program with multi-sensory techniques that fits the learning style of each and every child and is paced at his/her level. An academically challenging curriculum covering age-appropriate content fosters success for each child. Reading curriculum, based on the Orton–Gillingham approach and individualized to meet each student’s needs. Gaynor’s Orton-Gillingham Instructional Program has been officially accredited by the Academy of Orton-Gillingham Practitioners and Educators. As such, we are an Organizational Member of the Academy and a member of the Academy’s Council of Accredited Programs, one of only two schools in the New York metropolitan area to be so certified. 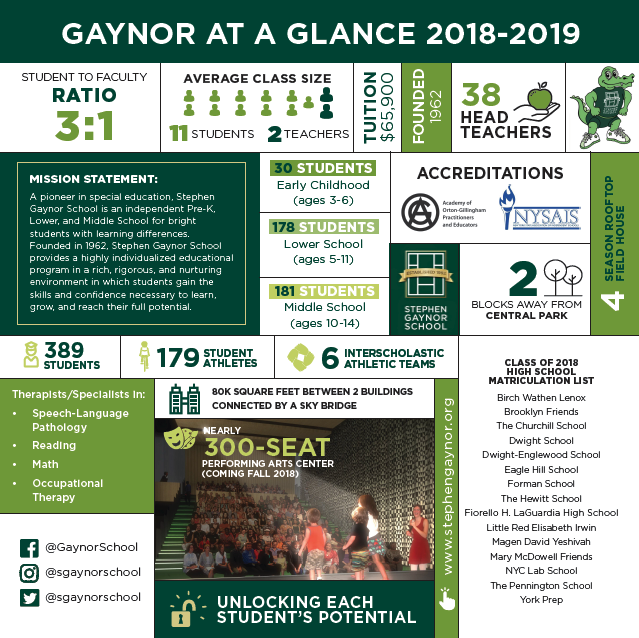 Gaynor is not just a school, it’s a community. Gaynor families choose our school because of the academic program AND because they want to be part of our nurturing environment. We have a two-building campus close to Central Park, which we use for sports, school activities, picnics, and nature walks. 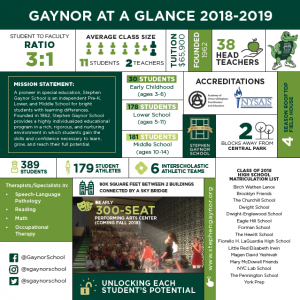 For the academic year 2018-2019, 389 students are enrolled at Gaynor between our Early Childhood, Lower, and Middle Schools. Our students come from all five boroughs, Westchester, Long Island, New Jersey, and beyond. Gaynor strives to ensure tuition is not a deterrent for any student wishing to attend our school. With this in mind, we provide scholarships and financial assistance to qualified families. We work with School and Student Service for Financial Aid, an agency that works with many of New York City’s independent schools. New York State Association of Independent Schools. Organizational Member of the Academy of Orton-Gillingham Practitioners and Educators, and Member of the Academy’s Council of Accredited Programs. Our program meets the International Dyslexia Association’s Knowledge and Practice Standard.